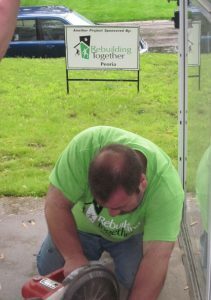 Each April, several of our members work with Rebuilding Together, a collaborative program which refurbishes houses for needy people in Peoria. 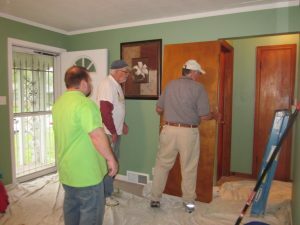 In 2016, we helped fix up the house at 2013 W. Martin Street in Peoria. 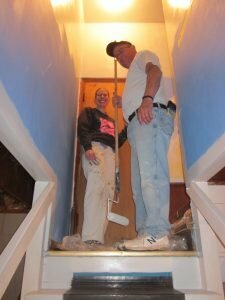 A French drain was installed, painting done inside the house, the garage and foundation, also a railing installed, and floor laid in the bathroom. 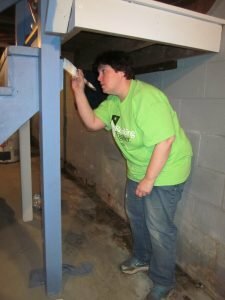 These efforts are subscribed by the Mission Budget and through the congregation through identification of a church volunteer representative/project leader who works with the Rebuilding Together organization on the scope of work, assignment of the specific property and owner to work on/with and then works with the congregation to solicit volunteers and determine specific assignments. In 2017, the scheduled work dates are April 22 (pre-work) and April 29 (final work). 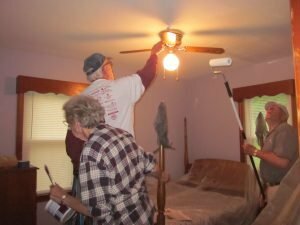 This is a great opportunity to get involved to help others in the community.